Luxury-focused Speyside single malt Macallan is axing its colour-led 1824 range, part of a wholesale revamp of its whisky portfolio. The rethink also sees the rebranding of Macallan’s Fine Oak range – which uses ex-Bourbon as well as American and European oak ex-Sherry casks – as Macallan Triple Cask Matured, to bring it in line with Macallan Sherry Oak and Macallan Double Cask. The plans also include the discontinuation of Macallan’s 1824 series – a range of four NAS single malts launched in 2012 and named Gold, Amber, Sienna and Ruby, based on the whisky’s colour. The range was criticised by some whisky enthusiasts, and Ruby was discontinued last year thanks to a lack of available stock. Now Amber and Sienna will also be withdrawn, while Gold will be absorbed into the Double Cask range as Macallan Double Cask Gold. Meanwhile, there are plans to release higher-strength and higher-age variants of Macallan Double Cask 12 Years Old following the ‘global success’ of the expression since its initial release in 2016. Macallan said the range changes were made ‘following feedback from customers and consumers’. 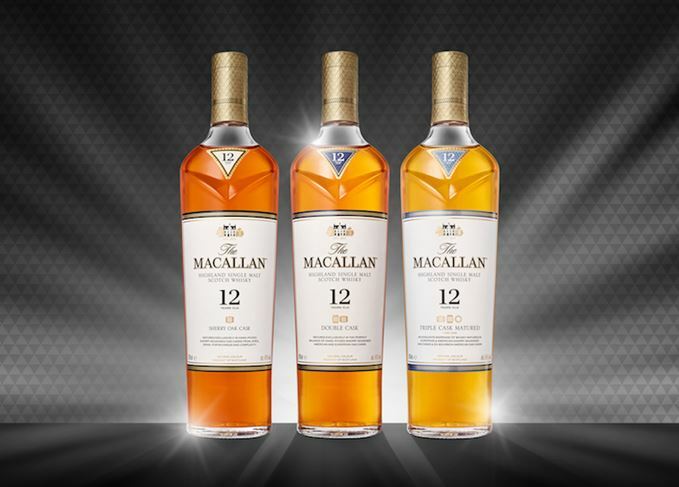 The changes also involve a new bottle design, described by Macallan as ‘a bold new look’ and said to have been inspired by the packaging of Macallan Rare Cask and Rare Cask Black. The new bottle has broad shoulders, with a chevron cut into the bottle near the neck, and also includes an anti-refill closure and the use of anti-counterfeit technology. ‘With this bold new design we want to do justice to the extraordinary whisky inside the bottle which, of course, is what we at The Macallan and every whisky fan worldwide really cares about,’ said Glen Gribbon, Macallan marketing director. ‘We think the new bottle looks as good in a world-class bar as it does on a table at home being shared with friends. Discussing the renaming of the Fine Oak range, Gribbon added: ‘We want to make it easy for our fans to select a whisky that’s right for them. What could be simpler than one, two, or three cask types? The new range and redesigned bottles will begin a global roll-out from April this year. Macallan’s new, £100m-plus distillery, which began production trials late last year, is due to open to the public this summer.